this is a wonderful post by lauren hirsch over at TUAW. I love these type of posts, where a techie uses the equipment they have to create a whole greater than the sum of it’s parts. 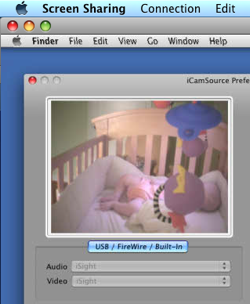 here lauren uses an older mac mini and a webcam, combined with her computer-networking experience and a couple of apps, she creates a real-time baby monitor that allows her to view the crib via chat on any computer at home, on her iphone (soon pushed upon audio detection, when the baby cries for examples) and moreover, to allow friends and family worldwide see the baby in real-time. The mighty mini, take two: DIY video baby monitor. It has been 5 years that i do not use any type of cable/sat TV service. the setup is a 50″ plasma with a mac mini hooked up, where i stream video content over the interent, to the home network to the wireless router to the mac to the tv to the surround sound system. sites like hulu, youtube and netflix have been the dominant ones that controlled our living room. below is a good list of other ventures entering this arena. i agree 10% that the DVD is long dead and that streaming is the answer. there are some requirements in terms of hardware and network, and with the wonderful work done by the studio (take hulu for example) we can all expect more wonderful, low-cost services in the near future. Movies online: The future is (almost) here – Beyond the Multiplex – Salon.com.